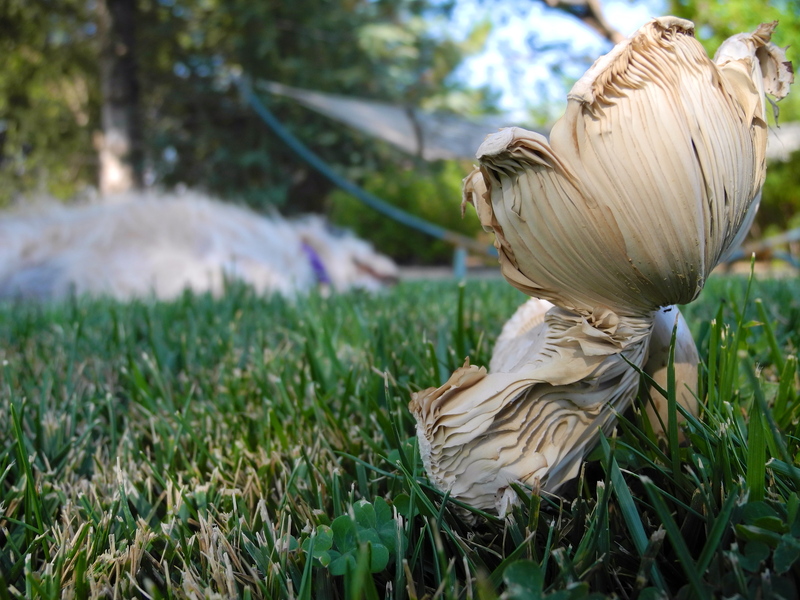 When the temperature climbs so high that the dog can’t be bothered to even look up at you because she’s finally found a shady spot and does not want to move, and the hammock hangs unused in the still air, a lawn mushroom is the only natural creature that seems to have any life in it. The mushroom blooms out of the lawn, having benefited from the unquenchable need of grass to be hydrated and declares to all that “these are the ideal conditions for me!” It seems to grow bigger as the hours tick past, while everyone else just get stickier and crankier, and indeed the mushroom is expanding! It finally becomes an advertisement for vitality, biology, good health and adaptation. Well, la dee da, mushroom. Good for you. We, like the dog, are all too hot to move. However, once I had a long drink of iced tea and my internal temperature has gone down a few degrees, I can see there is much to admire about the mushroom. It is graceful and thriving in its environment and it is a good neighbor to clover and grass alike, providing a tiny umbrella of shade in an otherwise sunny spot. The ants are happy to be close as well, and thankful no doubt for the tasty spores they find between the gills of the white spouted whale in the ocean of a lawn. Perhaps in an hour or so, when the evening starts to cool, I might try to interest my dog in the adaptable mushroom. Will I have any luck?